There are many types of TV antennas on the market. But choosing the right one and installing the antenna yourself can be difficult. Some do look similar but perform differently. 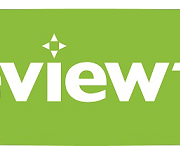 we’ll go through the main ones so you know which TV antenna is the best one for you with-in the Newcastle, Lake Macquarie and the Hunter region, as different parts of Australia will need different TV antennas. To start off with, the most common type of antenna is the Yagi TV antenna. Back in the days of analogue TV reception, this kind of TV antenna was ideally used for line of site to the TV tower (and still can be used with digital). 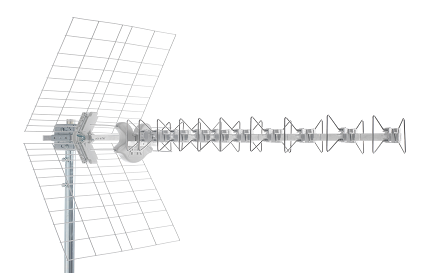 A Yagi antenna can come in different lengths. 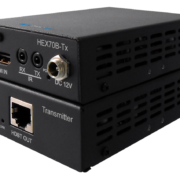 This will plays two roles, first off it is to focus the TV reception, and then second, the longer the antenna is, the more focused it is. 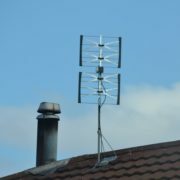 As a result, the antenna will pick up more reception (gain). This type of antenna was also the cheap when bought in its shortest form because it had low gain. Unfortunately, analogue TV reception has it’s bad points, which one was, it can produce ghosting images on the TV. This is due to a reflected signal from something like a mountain or building. The TV antenna would pick up the reception from another angle and then introduce it into the antenna. So both signals, the reflected and original signals are both displayed on the screen at the same time. Depending on the distance and the strength of the reflected signal (off the building or mountain), this would tell us how bad the reflected signal would be (the ghosting image). One way to combat this was to move the antenna in a different direction. Turning the antenna as much as possible to 90 degrees of the ghosting signal or better yet install a high gain (longer antenna) TV antenna to focus the main reception more is better again. Yagi TV antennas are still used and are still an excellent solution to a problem that needs to be fixed, but only if you line of site to the tower. A standard gain Yagi TV antenna on the right. This antenna is short in length, as you can see on the left, the radial pattern diagram of the antenna starts to really loose reception at 30 degrees. At 90 degrees it will not pick anything up at all. A high gain Yagi TV antenna pictured on the right. Notice the length of this antenna is longer than the antenna above. The radial pattern on the left for this antenna show that the reception really drops off at 15 degrees. This antenna is more directional then a standard gain antenna. 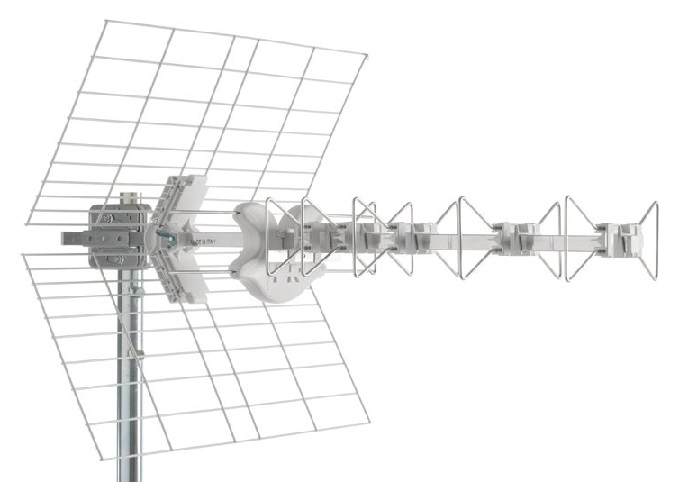 On the left is a Phased Array TV antenna, notice that it is a flat TV antenna. 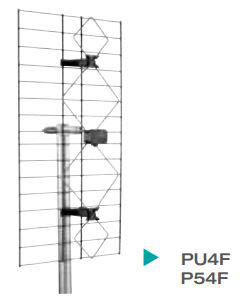 This antenna has a larger surface area to pick up the reception from scattered signals. The radial pattern on the right shows that this antenna is not as directional as the Yagi TV antennas. The reception starts to drop off at 30 degrees and even more so at 45 degrees. With digital TV, we won’t see this issue as much as we did with analogue TV. 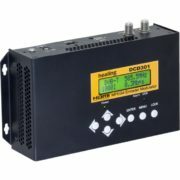 The signal is either there or not, but the signal can also have “digital errors” within the signal. 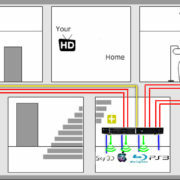 Without the proper equipment to find the problem, knowing what the problem is will be a lot harder and you can be running around in circles wondering why the TV keeps freezing or saying No Signal (square boxes and the picture freezing). There can be many reasons for this and it’s always going to come down to the location of course. If you are down in a gully or surrounded by a lot of trees, this will be worse than being high up on a hill of course. Also, if your antenna equipment is full of rust (not necessarily falling apart) or your antenna equipment is ancient, this can also be a major problem as those parts may need upgrading, not to mention the type of TV antenna you’re now using as some antenna just are not up to standard. Other major problems can also be poor workmanship from the last antenna installer, so keep an eye out for that as well. Have a go yourself, but if it doesn’t work and you end up giving up, you’ll then have to call us in to fix your TV antenna installation problem. As a result, you could be paying a little bit more than if you would have called us in originally, trying to achieve something yourself is great but you could be just giving yourself more headaches. Please note, a TV antenna booster will not always work, the reason is if you start with bad reception, you will only boost bad reception.